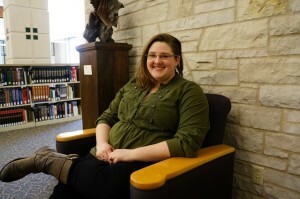 Did you know that the Seeley G. Mudd Library has its very own task force? 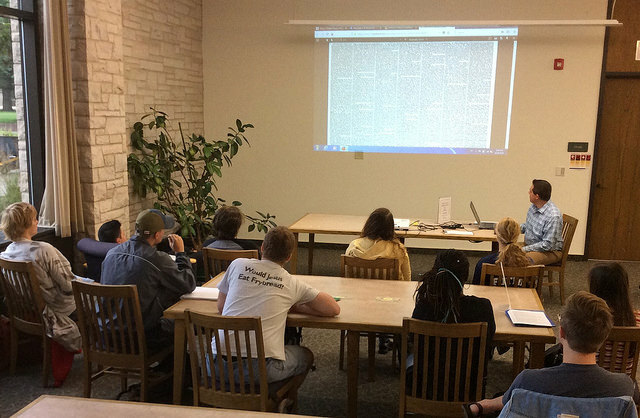 If you use the library, this information is directly related to you and your work. In fact, the Mudd User Experience Task Force exists solely to make your experience in the Mudd better! 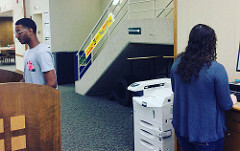 Have you noticed the new library work station near the copiers? The station has been stocked with various supplies to help you prepare papers, posters, and presentations. Have you ever lamented the shortage of power sources on the library’s upper floors? There have been oodles of outlets added for all of your charging needs. These are two examples of the small, simple, yet incredibly useful improvements to the library undertaken by the Mudd User Experience Task Force. Library Director Pete Gilbert felt that the rising library trend focusing on optimal user experience was worth paying attention to. 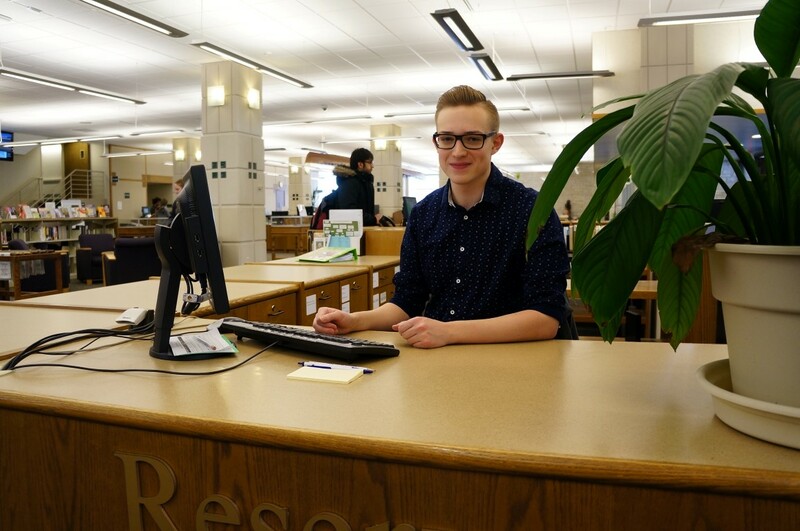 With that in mind, he allocated a small sum of money and assembled a group of library staff to spend time focusing solely on our patrons’ experiences in the Mudd, and what we can do to improve those experiences. Cindy Patterson, Andrew McSorley, Angela Vanden Elzen, Susan Goeden, and Holly Roycraft have been meeting regularly to explore simple, cost-effective ways to make a big difference to our library users. The group also spends time soliciting ideas, comments, and suggestions from students, staff, and faculty on how the Mudd can be even more helpful and efficient. So far the task force has added some desk lamps and additional power strips throughout the building to allow for clearer reading and fully-charged devices. They’ve also done some simple projects, like rearranging the furniture on the second floor to better accommodate collaborative groups gathering to study. With users asking for both quiet spaces, as well as spaces to let loose and have fun with a group, the task force simplified the library’s noise policy, stating clearly the first and second floors are open to collaborative, group study and therefore may be noisy, whereas the third and the fourth floors are for quiet, individual study only. 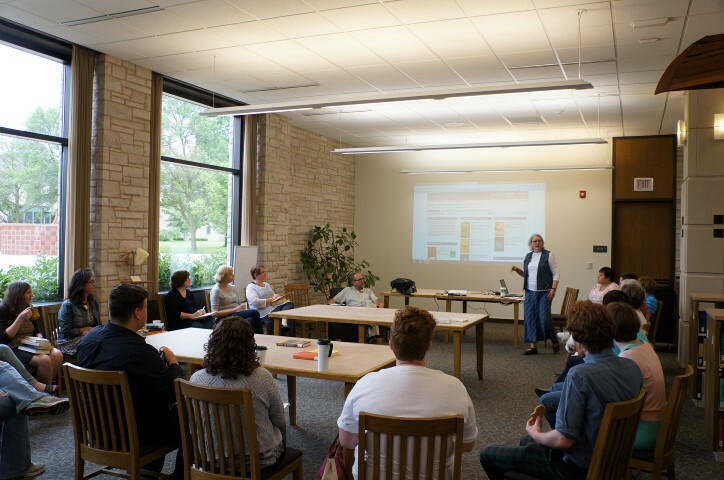 The task force, which welcomes all feedback about the library experience, worked with Gaming House over reading period to host a game day in the library, in order to draw attention to the large selection of games that we circulate. 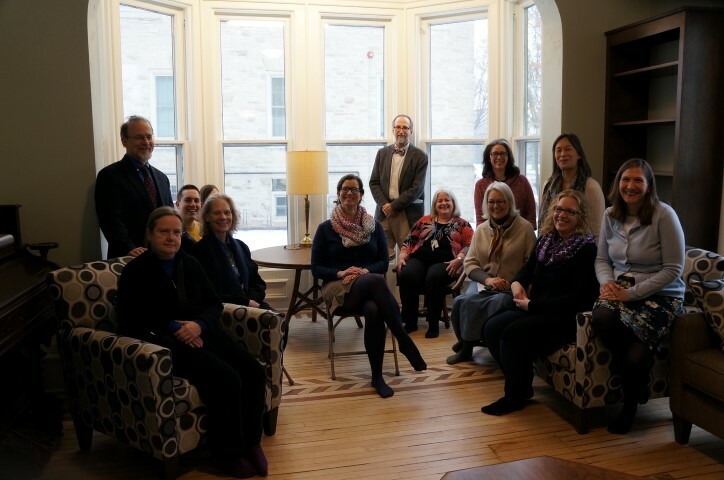 The task force has many ideas for further improving our patrons’ experiences in the Mudd, including even more rearranging, and perhaps some more flexible work spaces and additional comfortable spaces for relaxation. We truly value our patrons, and we aim to continuously improve your experiences here. Please feel free to reach out to any or all members of the task force with your feedback as to how we can make the Mudd even better. We want you to have a great experience here, and we have the task force to prove it! Tyler Grasee is another of the Seeley G. Mudd Library’s wonderful Circulation Assistants. He is adept at the full array of circulation duties, including helping patrons find and check out materials. 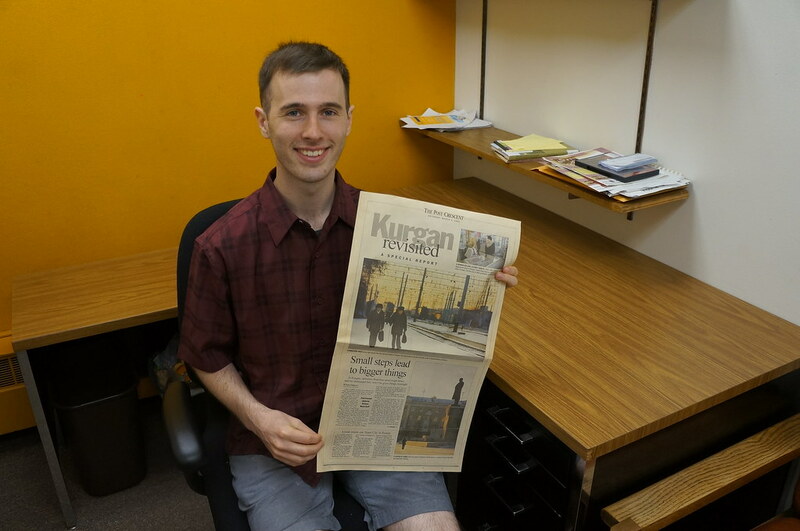 Tyler, who is an anthropology and German double major, has worked in the Mudd since his sophomore year at Lawrence. We appreciate his sweet and helpful nature, and are always impressed with his impeccable sense of style. Read on to learn more about Tyler! Tyler, where are you from? I’m a local! Originally from Green Bay, Wisconsin. I love the interactions with professors, visitors, and other non-students. Working with and meeting new people are nice breaks from studying. I’m not certain I’ve done anything particularly notable behind the desk, but there is definitely a sense of personal satisfaction on the rare occasion I find a lost book. 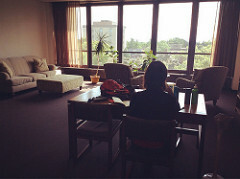 As a student, where is your favorite study/relaxation/hang-out spot in the Mudd? The Kruse room on the fourth floor has a great view and very cozy furniture. Though traveling, attending concerts, reading, and writing are all at the top of my list, food will always be number one. There is nothing I appreciate more than an interesting culinary experience, whether it be out or at home. I’ll eat anything. “The Prophet” by Kahlil Gibran. If you like poetry, it changes your life within the hour it takes to read. Classical music is my first love, but I usually find myself listening to Disclosure, FKA Twigs, Grimes, SBTRKT, Tei Shi, Lana del Rey, Janelle Monae, Edith Piaf and Marlene Dietrich, and of course, Beyoncé. This is difficult for me to narrow down, but I’ll give it a try: Fast Company, Chronicle of Higher Education, Hello Mr., New York Magazine, Dazed and Confused Magazine, the Atlantic, Vogue, and GQ are a few. I’ve been most active in Hillel, Anthropology Club, and GLOW. I’m graduating this spring! I’m hoping to get my Master’s in museum studies. Is there anything you’d like to share about the Mudd with your fellow students? 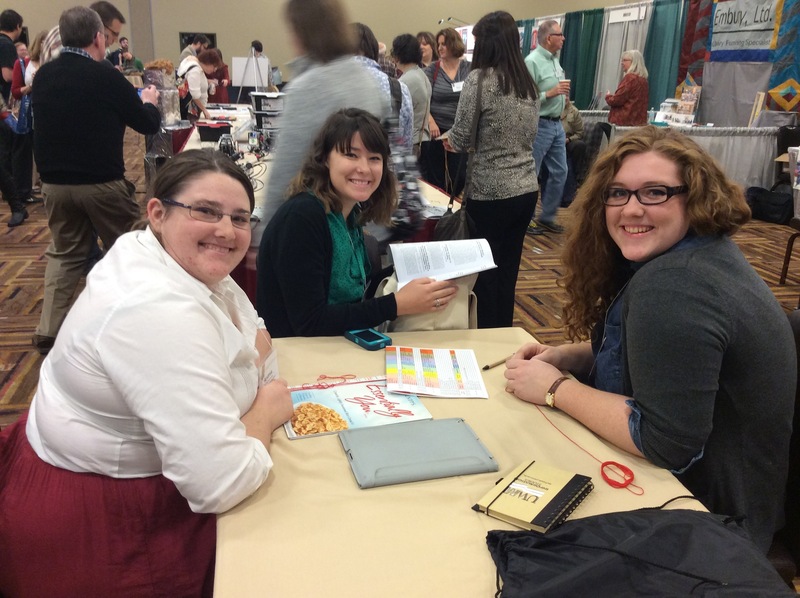 Interlibrary loan is a great tool, use it! Devin Ditto is a psychology major from St. Louis, Missouri, and works as a Circulation Assistant at the Seeley G. Mudd Library. We love to see her smiling face from behind the Circulation Desk, where she helps students and faculty access course reserves, locates materials and assists students in navigating the stacks, and helps patrons use the copier, scanner, and printer. Devin enjoys working in the Mudd, and it shows! 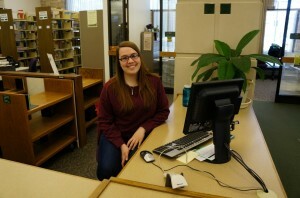 We asked this circulation assistant a few questions so that you, our faithful patrons, could get to know her and her work in the library a little bit better. Be sure to say hello the next time you see her in the Mudd, and you may get a glimpse of her shining smile yourself. Devin, how long have you been working at the Mudd? This will be my second year working in the library. I think my favorite part is helping students find what they are looking for. The other staff members are pretty great as well. It depends on what kind of mood I’m in. If I actually want to be productive, somewhere on the second or third floor. If I want to be a little bit productive but still talk to friends, the first floor. And if I want to make myself believe that I’m being productive, the Kruse room. Gone Girl – I read at least 200 pages in one day over reading period. Oh my gosh, so many favorites that I don’t think I actually have a favorite! I will graduate in June. I’m not sure what my post-graduation plans are, but hopefully working, so that I can save up to go back to school, is on the agenda. Actually use it! It has so much stuff to offer, from great study spots to a friendly environment. The staff is always really helpful, and you will almost always be able to find what you need or are looking for.